In ancient Egypt, batteries were produced to provide electricity for electroplating jewelry. Thousands of these objects have been found, as have been plated jewelry. A byproduct of this technology was the creation of metalized water with healing properties. People who worked in this “industry” suffered few infections since the water laden with silver or gold would kill bacteria and other pathogens. In fact, no known pathogen can survive in the presence of water laden with silver. Today, we know this material as colloidal silver. It has been tested against over 600 viral, bacterial and fungal pathogens and none has survived in a petri dish for more than 5 minutes! Just as an aside, it is totally nontoxic to people in the quantities known to kill these pathogens! With such information, why are people running scared, dying needlessly or remaining totally ignorant of this apparent miracle? Again, money. No one can patent this element (silver) or this process, though they have tried! So, what do they do? They cast doubt and fear on the process. They declare it a “Lunatic Fringe” process and material in the realm of witches and fools. Hurting and dying people be damned! And, that is where we were about two years ago. Today, the genie is out of the bottle. Real science is stepping up to offer credible treatments for infections using this silver material. Many home operated “Colloidal Machines” for the average person to brew their own are available today. Too many articles have been written and too many honest scientists have stepped forward in support of this technology to call it quackery anymore. Very soon, hospitals will use this process to eliminate the horrors of “Hospital Acquired Infections”. They actually will have little choice. 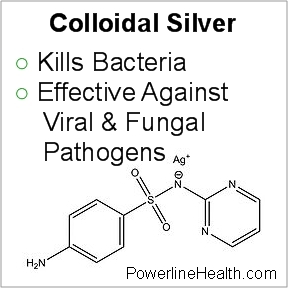 Here’s the most exciting thing about Colloidal Silver: no fungus, virus or bacterium can adapt and become immune to its toxicity, period…ever. Now, let’s look at just what this material is and what it is not. It is silver suspended in distilled water. However, it is not silver at the atomic level. It is silver molecules suspended in water. Molecules are two or more silver atoms bonded together. Generally, the parts-per-million density (PPM) of colloidal silver never exceeds 20-30 PPM. So, what exactly is a colloid? In chemistry terms, a colloid is a molecule of a single element suspended in a liquid, generally water. Many companies are selling “Colloidal Silver” with PPM’s far greater than 20-30; often reading in the hundreds or thousands! This cannot be colloidal silver since exceeding 20-30 PPM causes the silver molecules to clump and fall to the bottom of the container. So, how do they get to these high PPM levels and what has happened to this supposed “Colloidal Silver”? Generally, it is manufactured with voltages in the ten’s of thousands of volts! This drives silver atoms (stripped of some of their electrons) from silver rods or plates suspended in water off into the water. These atoms do not want to join with other silver atoms and clump together to form molecules. Actually, these atoms have become silver ions (atoms stripped of electrons) so therefore, they can no longer meet the chemical requirements of being true colloids (molecules suspended in water). Yes, it’s silver but the biological effects are drastically different. And, it is now false advertising to call this solution Colloidal! In our bodies, this material now known as Ionic Silver, takes only a few seconds to “find” another material from which to acquire an electron…sodium chloride…the salt in your blood! The “new” chemical created by this bonding has now become Silver Chloride Salt, the same silver chloride salt that were first used to coat paper and make the first black and white photographs…your blood becomes photosensitive! Not the case with Colloidal Silver. This material is composed of silver molecules that are not looking for an electron “meal”. They simply flow through the body’s blood system destroying viruses, bacteria and fungus, and are then flushed from the system by the kidneys or the bowel. These molecules also have a much larger surface area with which to come in contact with these pathogens. Meanwhile, in the ionic silver user, the skin may become somewhat blue in tint over time with excessive use. It is a bit ironic as the ionic silver is clear no matter what the strength while the colloidal silver has a slightly bluish to yellow tint. No one taking colloidal silver has ever become a Smurf. Even stranger, is the fact that ionic silver companies call their products “supplements” and go ever further to suggest a daily usage. Ever wondered exactly what is the definition of a supplement? It’s simply a material one can take which the body already requires for its biological processes. Curiously, silver of any kind, Colloidal or Ionic, is not a supplement and has no biological function in the human body. You simply cannot become deficient in silver! Perhaps, this is why it works so well as a “natural antibiotic”. Therefore, claiming that it’s a supplement and recommending daily usage should be illegal and must eventually be stopped. Buyer be aware and be forewarned! This article should help. Perhaps it should give you the ability to take what many peddlers of “Colloidal”/Ionic silver have to say with a “grain of salt”. Remember, this salt could be useful if you decide to believe their hype…..
Use this Coupon: TrySilver2 and get $2.00 off each bottle of Silver Power in your order.